Country Music Excludes Women, Study Finds A new study from the Annenberg Inclusion Initiative finds that female artists and songwriters are being severely underrepresented in Nashville, with women over 40 being particularly excluded. 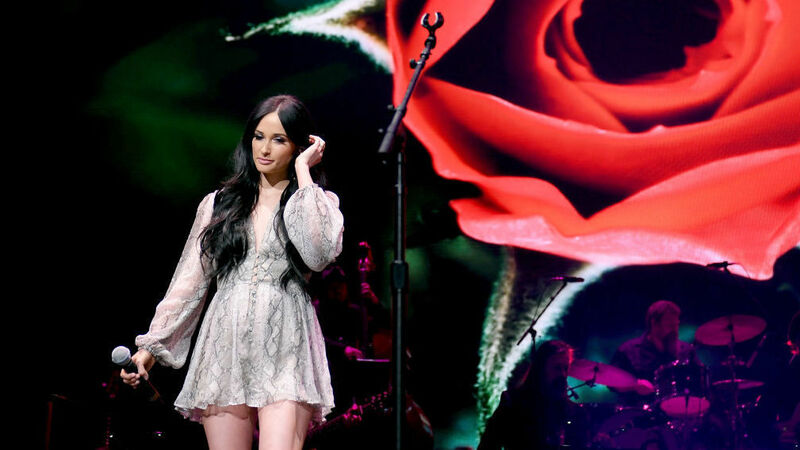 Singer and songwriter Kacey Musgraves, performing in Nashville on April 1. Despite the successes of musicians like Carrie Underwood, Miranda Lambert, and Kacey Musgraves — who won the 2019 Grammy for album of the year for her project Golden Hour, as well as best country album and best country solo performance — the voices of women creators are severely underrepresented. According to the Annenberg researchers, led by Stacy L. Smith, only 16 percent of country artists are female, and only 12 percent of country songwriters are women. The team also notes that when female country artists do find mainstream success, they are young. "Not one of the top-performing women was over the age of 40," they note, "while all but one of country's top-performing men had reached or exceeded that age." They found that the average age of top female artists is 29 years old — while for men, the average age is 42. For its data, the Annenberg team looked at 500 songs on Billboard's Year-End Hot Country charts (which measures a combination of sales, streams and radio airplay) over a five-year span, from 2014 to 2018, and looked into the gender of both artists and songwriters of those songs. They also examined the nominees across four categories at the Academy of Country Music Awards (whose voters work full-time in the country music industry, from artists to managers to people who work in venues) across the same time frame, and found that only 15 percent of the nominees in those categories — entertainer of the year, song of the year, duo of the year and group of the year — were women. Billboard magazine reported last December that for the first time, its Country Airplay chart listed no female artists in its Top 20. The Annenberg team says that its research was triggered by the Academy of Country Music (ACM) Awards nominees announcement in February, in which not a single woman was put forward for entertainer of the year. The Annenberg report was released just ahead of the 2019 ACM ceremony, which will take place this Sunday in Las Vegas. The event's longtime host, singer Reba McEntire, said in a interview with the PBS NewsHour that the situation was "disappointing," but added: "It didn't surprise me." She also said that Nashville has a "bro culture," where "everybody's good old boys." According to the researchers, people in the country music industry are hesitant to bring up the gender gap issue, out of fear of retribution. "One of the reasons we did the gender in country music research is that there is so much fear in this space. People are terrified to speak," the Annenberg group wrote on Twitter. The Annenberg study comes on the heels of news that a viral song by Lil Nas X, "Old Town Road (I Got Horses in the Back)," was removed from Billboard's Hot Country Songs chart because it "does not embrace enough elements of today's country music to chart in its current version." On Thursday, Lil Nas X released another version of his song — this time featuring a mainstream, white and male country artist: Billy Ray Cyrus. Critics say that Nashville's country music industry is filled with gatekeepers whose vision for the genre is centered on white and male artists — and that the audience's tastes are shaped by those forces. Shane Morris, a digital artist development expert in Nashville, told Morning Edition on Friday: "They [the fans] very much are given what they're supposed to like, and then that's that." The Annenberg researchers strike a hopeful note, however: They are partnering with a number of companies and organizations, including Universal Music, Live Nation and the Academy of Country Music. In a statement issued Friday, Cindy Mabe, president of Universal Music Group Nashville, says: "We clearly have a problem. Our job is to amplify our artists' voices and help them introduce their stories and connect to their audience. This has gotten increasingly harder and limiting over the last few years, especially for women and it has dramatically affected the perspective, reach and depth of our country music genre."